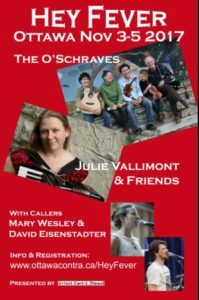 The O’Schraves are excited to be one of the featured bands at the Hey Fever Ottawa Contra Dance Weekend, November 3-5, presented by Ottawa Contra Dance! Registration is open. There is an option to purchase the Saturday lunch at registration time. A draft of the schedule is now available on the Schedule page. It will be further updated over time.